I wish all of you a very Merry Christmas and a Joyous 2019!! This past year has been very great for me. I have enjoyed working to get my art career on track and it has be extremely satisfying. I have been selling my paintings at the Railyard Artisan Market since April of this past year and it has been fun meeting fellow artists and the wonderful people that come to appreciate and buy local creations for many varied mediums. 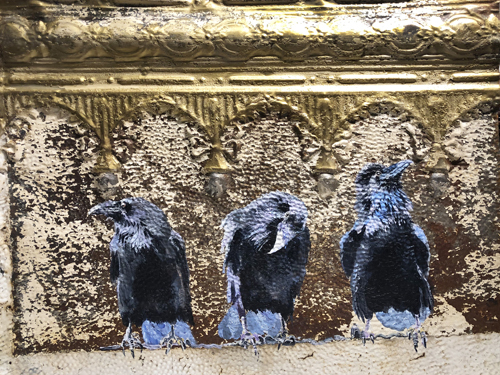 I have been fortunate to do two juried shows this past year, one, the Sidewalk Arts Festival in Sioux Falls, South Dakota where I was able to see my Nieces and Mogen cousins and the Recycle Santa Fe Art Festival a couple weeks ago. I received notification that I was accepted into the 31st Annual Rio Grande Arts & Crafts Festival Spring Show this next March 2019. More info to come. Thank you all for you interest in my art and hope you all have a Happy New Year! !